The story of the 1941 Goodwill Tour to South America made by Walt Disney and his staff. Sting's wife Trudie Styler documents the turbulent bureaucracy both Sting and the filmmakers went through in order to complete The Emperor's New Groove (2000), a Disney film that underwent extensive storyline changes from start to finish. Narrator: For the last 20 years, a group of artists and scientists have transformed two-dimensional drawings into their own three-dimensional worlds. Thomas Porter: Art challenges technology. Technology inspires art. John Lasseter: The best scientists and engineers are just as creative as the best storytellers. My review of The Pixar Story allows me to release a theory on the studio's film Toy Story I vaguely established several months back and only came to fully formulate upon watching the documentary. The film details how Pixar was so advanced, innovative, and intimidating to several graphic designers and the animation industry in general, it was somewhat ostracized and manipulated by Disney because they had no idea just what to do with them. Sort of like how in Toy Story, Buzz Lightyear is sort of brushed off and mocked by Woody and several other toys upon his arrival. However, by the end, the toys all learn to work together in unison for the greater good of...the toybox, perhaps? If you allow Buzz Lightyear to represent Pixar, Woody as Disney, and the additional toys as other animated studios and computer designers, the film is sort of allegorical in the regard to the rise of Pixar. Whether this is intentional or not is up for serious debate. I think it was just my brain overworking itself after a long line of average movies. 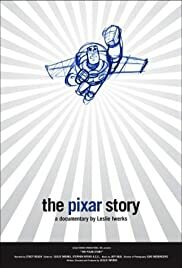 On the other hand, the documentary The Pixar Story is, like the studio, something to behold. It's a necessary and efficient profile of one of the best and most powerful studios today, and sheds light on the innovators creating the films loved by kids and adults alike. It begins by showing us three men that drove the forces of Pixar as we know it. They are Ed Catmull, a technical officer, Steve Jobs, the late entrepreneur and CEO of Apple, and John Lasseter, Pixar's founding father. We learn that Lasseter was into animation from just a little kid, and relished the thought that he could grow up to make cartoons for a living. He attended California Institute of the Arts, where he won back-to-back Student Academy Awards for two short films he made while in school. When he finally got a job at Disney, he spent a lengthy time developing ideas for intriguing and innovative cartoons before he was fired because Disney, ultimately, didn't know what to do with such an ambitious soul. He was trying to introduce the wonders of computer animation to the company in the mid 1980's, when the machine was already being feared as a substitute for man. Lasseter tried to implore, however, that the computer is a tool for the artist and that it's inherently incapable of creative thinking. That's where an artist comes in. Catmull who assisted a lot with the technical side of Lasster's animation and even is credited with creating the first computer animated scene in film history in the 1976 film FutureWorld, while Jobs invested and believed so much in Lasseter's vision he was able to take several financial beatings before even returning any money, leading him to be called the world's most forgiving venture capitalist. In a sense, these men were rebels without a utensil. They believed in a new way to create art enough to further it and churn out film after film, each one a financial and critical success. After establishing the three men, the film looks extensively at the production of Toy Story. Lasseter claims that making this the studio's first feature was an intelligent decision because he stated early on he did not want to follow in the footsteps of Disney by creating frothy musicals and mythical fairy-tales. Through numerous uphill battles, the film was made and received universal rave reviews. The animation was dazzling, the storyline clicked with young kids and the adults, who didn't see the film as one to endure but one to enjoy, and the immensity of the animated setting and the gravity-defying ways the characters were moving was simply remarkable and never-before-seen. The film also details how the film's release sparked questions about the future of computer animated features and whether or not they would be the future and hand-drawn/traditional animation would later be phased out with the times. The Pixar staff in the film make perfectly clear that time between Toy Story and A Bug's Life, their followup film, was nervewracking because they had to prove that they were the real deal and people weren't just overhyping their work. On a final note, the latter act of the film concerns the traditional vs. computer animation debate and how after Disney films began to take a loss in revenue, the medium of traditional animation was rejected in favor of its sleeker, more visually dazzling cousin. In my opinion, the two could've coexisted and the demise was the fault of studios like Disney and DreamWorks not updating their stories and not their technology. Pixar raised the bar in animation, but it did the same in storytelling too, and American audiences didn't care to see a film like Disney's Home on the Range, Jungle Book 2, or Teacher's Pet when their sister-studio Pixar was churning out films like Finding Nemo, Monsters, Inc., and Toy Story 2 during the exact same time. Pixar's magical quality stemmed from them allowing the stereotype of animated films being for kids to gradually disappear and get adults, teenagers, and the elderly excited for their latest endeavor. The bar was raised in both departments, and Disney should've realized that films about singing cows and singing jungle animals weren't going to cut it any longer. The demise of the animation the studio pioneered was its own fault - not Pixar, who unfortunately was handed much of the blame. The Pixar Story is a solid documentary exploring a profound, revolutionary studio, and, in addition to it taking a look at each individual Pixar film (we can try and forgive the huge amount of time the film spends developing Toy Story and how the remaining six features get the cold shoulder in terms of how much time they're allotted on screen) explores a medium that definitely deserves a documentary in its honor.